“Compression” is what horn technicians and players call a valve or tube’s ability to accept air pressure coming from your lungs without leaking. Since the actual pressure inside the horn is low, the term compression is not entirely accurate but has become a standard term when talking about leaks. The horn industry lacks for objective data to evaluate a horns playing characteristics and condition and the valve compression score has been one of the few hard numbers that we can use to compare horns objectively. However, it is a far cry from the comprehensive and authoritative proof of quality or condition that it is sometimes billed as. Without additional context, the numbers are essentially meaningless. So, here is a layman’s explanation of these numbers and what they do or do not tell you. These numbers come from a device called a magnehelic gauge. Originally developed to measure low pressure HVAC systems, a magnehelic measures the differential pressure between two closed systems. So, you input a pressure of a known amount on one side of the machine, and measure the pressure on the other side. 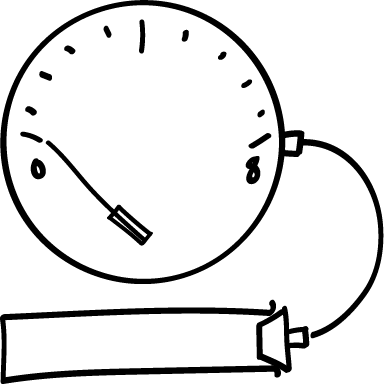 The difference in pressure between the two sides is measured in “inches of water.” This weird unit comes from another kind of differential pressure device called a manometer. You can look that up yourself if you’re really that interested. It’s a very cool device. These kinds of devices are calibrated to atmospheric pressure. When it is open completely, it will read 8. The result from the machine is highly dependent on the setup and calibration of the gauge; mag readings from two different shops may or may not be exactly the same. 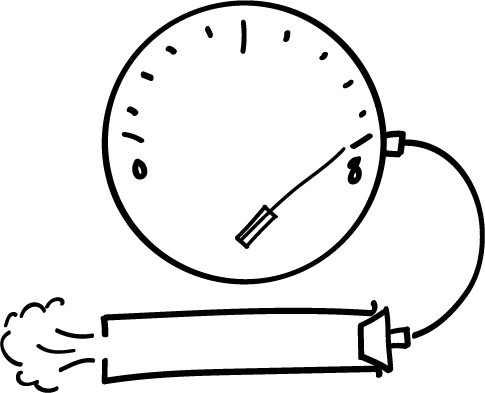 When the dial reads 0, the joint or valve is fully sealed. A full seal is great for joints and slides, but a valve won’t turn if it’s this tight! It’s a debate among players and technicians as to what range of “compression score” is noticeable in the playability of a horn, and, at exactly what score are the valves ready to be rebuilt? My personal feeling is that a 1 or below is standard for brand new horns and that something over 4 should be rebuilt. On my custom horns, I shoot for a reading that is 0.2-0.6. Every maker has to balance compression with valve speed. A lower score valve has a tighter tolerance which means that a lighter valve oil must be used. These evaporate much more quickly and can give the impression that the valves are slower than a 20 year old horn where the valves have been worn down and are reading a higher number. If you are used to old valves with larger tolerances, a tight valve will feel “slower”. It would be up to you to decide if all the benefits of a tighter valve can overweight that speed that you are used to. When the valve is closed, we’d like for as little air to flow around it as possible. This produces a better seal and a lower mag reading. When a valve ages, or too light a valve oil is used, more air can flow (or leak) around a closed valve which will show up as a higher number on the mag. If you have any JoyKeys on your horn, you should not concern yourself with valve compression. Even if your valves have a perfect score of 0.2, your horn overall will be more like a 2.5 or 3 because of the JoyKey. In that case, you’re better off ignoring the compression, and focusing on the technical aspects (noise level, speed, etc.) of the valves. Many folks would argue that 3.0 is still in the range where it may not be noticeable in the playing. If you need a general rule of thumb, here is what I think most techs and makers would agree with. Just because someone shows you a number, doesn’t mean you must spend a thousand dollars on a valve rebuild. I’ve heard anecdotes from players who report liking a horn less after the valves were rebuilt. Nothing is universally good or bad (except bad craft, that’s always bad). The bottom line is, don’t get too hung up on valve compression scores, but if you want nice tight valves with a long life ahead of them, stick to something under a 1. Just be sure that whoever is measuring them knows what they are doing. While it’s just one number, it’s nice to be able to have an objective way to measure one aspect of a horn’s quality, even if it’s more nuanced than we’d like it to be.